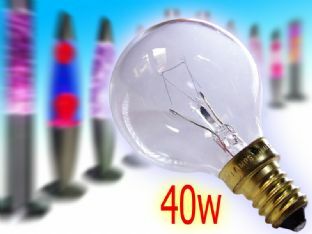 This little bulb is compatible with many older lava and glitter lamp designs that are in existence, they are also used in some decorative and motion lamps. It is a little round golf ball shaped lamp, fitting code is SES - E14 (small screw fitting) The bulb is 45-mm diameter and is a 25w rating, clear class. Total length end to end is around 7.5-cm. Please check your lamp for compatibility before ordering, it is vital you use the correctly rated and sized bulb as specified by the manufacturer of the lamp. We realize that many people are trying to get hold of bulbs to revive much loved lava lamps old and new, we are stocking a growing range of bulbs to try and accommodate your needs. Please always try to mach the bulb to the exact specifications of the lamp. If the bulb is not producing enough heat the lava will fail to rise to the top of the lamp, too much heat and the lava will collect at the top of the lamp, possibly also separating into small droplets. If the lamp has been on for a long time, especially in hot weather, it may simply need a little rest and must be allowed to cool off for a while. Excessive heat from the wrong bulb choice however could cause cracking to the glass bottle. The ideal lava behavior should be a constant flowing action up and down the full length of bottle. All lava lamps take time to reach optimum performance this depends on the volume of the liquid in the lamp, but 1 to 1.30 hours is not unusual for an average size lamp, very large lamps can take over 3 hours to get going. It is dangerous to try and speed up this process by adding extra heat, don't even think about it.